Either Randy and I think alot alike, or something. He mentioned my blog posts the last two weeks too. I appreciate his timeline of genealogical research here and have two comments. My Great-grandfather sat in a rural town at the turn of the century and collected--according to his meticulous records--40,177 relatives by writing back and forth to the parishes in England. He certainly accomplished more than I ever hope to. I'm now working with the family to try to extract and digitize his work. We'll be lucky to get that done. I think the speed of Genealogy research has increased, but so has the pace of our lives in general, and thus we don't have as much time as we would like for personal interests and hobbies. At least my life seems to be flying by at this point. Randy also sparked some ideas about online versus offline research. Being a librarian, who taught internet classes in the 90s, it has always concerned me that we go for the quick fix on the internet, instead of evaluating the information we find there--primary vs. secondary, timely, authority of the author, etc. I still find much more authoritative sources in a library or courthouse, and yet the pace of life has quickened so that I think many people don't bother if it isn't instantaneous on the net. As long as we evaluate our sources well, the internet can be a real boon, but sometimes speed makes for more sloppiness. Why don't we hold internet sources to a high enough scrutiny? Hmmm. I was supposed to give my "How charts can help your research" lecture at BYU yesterday but instead spent the hour filling out police reports on a car accident. I'm sorry if I missed you at class, I wish I had been there too--really. At least I have some other lectures and conferences to look forward to. And maybe, thanks to this other driver, we'll have a new car to take to them. I'm glad to get going on conferences again. 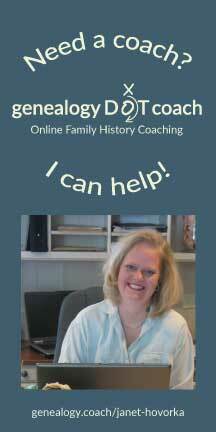 I so love working with other genealogists. They are always so fun to talk to. Kemmerer Wyoming, next Saturday, May 3rd. I'll be giving my Swedish research for the non-Swedish lecture and Where to Start When You Inherit Genealogy lecture. Kim's going to NGS Kansas City May 14-16th. He'll be printing onsite. Southern California Genealogical Society Jun 27-29th. We'll be printing onsite. Genealogical Council of Oregon July 19th. We'll be printing onsite. And at the Fall BYU conference they have just asked that I present my new lecture "Will your Work Survive the Digital Age?" Looking forward to that. And looking forward to Mesa with My Ancestors Found Nov 14th and 15. Their conferences are always so good. Be sure to drop by and tell me you are reading my blog. I'll be excited to meet you. I was recently asked by a college student why I am involved in Family History. Here is what I said, or what I should have said. Thanks to Holly Hansen for helping me refine my ideas in a later conversation. 1)It gives me a sense of belonging in life. When I see pictures of my ancestors or learn about their lives, I know that these people worked and sacrificed so that I can be where I am today. 2) It gives me a sense of purpose and a feeling that I can do it. When I was in college, I went through some trying circumstances that about put me under. During that time, I was given a short history that my Great-grandmother had written about her life. I found out that she had gone through much the same circumstances at about that time in her life. I knew that if she had made it through, I could. Recently, I learned of some of the circumstances she went through in starting her businesses. Again, it inspired me that I could do what I needed to with this business. She died a multi-millionaire. :-) None of the money trickled down much, but I have her dna. And really, some days, that is all I need. 3) Genealogy gives me a sense of perspective and wisdom. When you spend time looking at the whole span of life, everday crisis don't seem as important. I've written about this before, here. It gives me a sense of peace and contentment that I don't get anywhere else. 4) Genealogy heals. Everyone has good and bad in their family tree. When you understand what your great-great grandparents had to go through, or chose to go through, it is easier to see what they instilled in their children, and then what they instilled in their children. That can work both ways in self-esteem, world views, relationship issues, etc. I'm very blessed in alot of ways. But there are also some patterns that I want to stop with this generation. I can do that better knowing where they came from. Understanding promotes forgiveness. And change. 5) The biggest reason I do genealogy is for the spiritual nourishment it gives to my kids. The same as what I get above but for them. Once I had kids, everything was for them. I want to do anything to make sure they are happy and content and centered. And this is really the most important aspect of why I'm interested in my family's history. I want to inspire my descendants. The other day, my son, who hates writing, didn't want to finish his book report. I assured him that he had it in him, that he came from a long line of prolific writers, and college professors. Poor kid. He didn't have a chance. But he did finish it right up. I don't know if my comments helped get him going, but I think they did. Hopefully my efforts in teaching them about their family's history will envelope them in love and a feeling that they are strong and able to do anything they want to. From an earlier newsletter: I'll post it here so that people can refer to it when we all start heading to the reunions this year. We are often asked how to hang large family reunion charts. We've gotten some great ideas the last few months by being involved in some of your wonderful get togethers. The best thing we have seen so far is to use binder clips because they hold the paper tight without damaging it. Once you clip them to the chart every 2 feet or so, you can tape or pin the handles to the wall. Just be sure to use painters tape so that it comes off the wall easily. You can even string the binder clips together with rope and hang the chart between trees or along a fence. Or, if you have tables to fit the size of your chart, you can roll them out flat. This gives you great context for adding pictures or heirlooms that belong to people on the chart. Of course you don't need to have a huge chart to make everyone feel the unity and sense of belonging. We have done some great smaller charts this summer with pictures. Descendancy charts are the most spectacular with lots of photos. Pictures of people, places or historical documents bring the past to life. One customer recently expressed to us her gratitude for our help in making some large picture charts. In a family that had been struggling with unity, she said that collecting pictures had gotten cousins talking who hadn't for years, and everyone is excited to come to the reunion to see the finished product. You are welcome to send us your file for a FREE CONSULTATION and we can give you some great ideas. Let us help you make sure everyone knows where they belong and how important they are. Inspiring the next generation. By Lee Drew. Research Party. Go Lee. I promised this quite a while ago when I wrote The 10 Best Things To Do With A Genealogy Chart. 10 best things was easy to come up with, 6 worst things was harder to come up with than I thought. This one deserves a Lettermanesque count down. 6)Put it in the corner and let it collect cobwebs. This is what I did with the blank one that I never filled out. Now since I don't have to fill it out with what I already know, I can mark up my working charts with what I am learning and sources I want to look in to. 5)Apply as wall paper (tough when you move). You wouldn't believe how many people come to us after they have painted their family history on the wall and then have decided to move. 4)Put it on the wall to show everyone “it is all done.” A personal pet peeve. Why stifle all the fun? 3)Give them to the possessive relative without making a copy. All extra copies are 1/2 price at Generation Maps. 2)Send them to relatives who don’t appreciate them. We once had a client say that he was disapointed when he sent charts out to a family reunion that he wasn't able to attend. He did say they loved the tube it was sent in for storing cheese ?!? 1)Throw darts to see who you should try matching and merging in New FamilySearch. Apparently I come from good, hardy, mergemagnet stock. Though there are strains of money in my family, many of my ancestors are called IOU's--Individuals of Unusal Size. Maybe throwing darts would be the best way. I'm going to talk a little about our charts. That is what we specialize in, so that is my most unique expertise. Hopefully it will help your research. Not only do we do virtually any kind of chart that you want to dream up, we have dreamed up a few ourselves. We have developed charts that are what we would want for our own research, and that maybe might help yours. My newest personal favorite is our "To Do" chart. To start with, this chart is exclusively available as a New FamilySearch chart--which means that if you have a log in for New FamilySearch, you can enter your username and password for NFS on our website along with the ID number of the person you want to start this chart with, and the chart will show up in your mail. Easy. That is what we are all about. We can actually do any of our charts from your New FamilySearch data, just that easy, but this is a special one. You can see it on the right here. We designed this chart to deal with the issues of cleaning up and verifying the data in New FamilySearch. It gives you a clear plan of attack, and makes you feel like you are accomplishing something as you move systematically through the database and check things off. Hopefully we will shortly be able to offer this chart from a genealogy computer file or from other databases because it is really built to help you systematically go through any file that you haven't researched yourself. Each of the symbols above the check boxes denotes something that needs to be done: are the vital statistics there, have you checked the sources, have you entered your information and sources on this person into the database, are there merge issues, do you know who both parents are, etc. The chart goes out 6 generations, and depending on the information on your family in the New FamilySearch database, it can be up to about 6 feet tall. When I participated in Tim Cross's lecture at the Logan conference, I said, "This is our new to-do chart" and let a six foot sample chart drop to the floor. 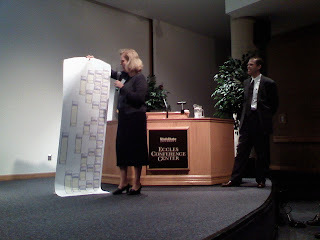 Everyone laughed because I was suggesting that your to-do list for New FamilySearch would be huge--six feet long. Well, #1, they were only laughing if they hadn't been in to the database to clean up overworked lines like mine. (I call my family's lines the "burned over district" but that is another post). 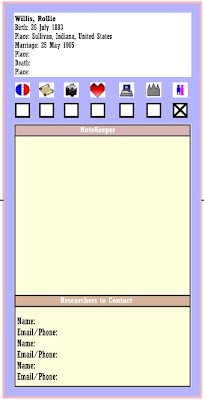 But #2, the reason this chart is so big is because we have given you lots of space to take notes on and analyize with. It is perfect for the back of a study door. Or I would love to see it used at a family reunion to divide up the work and keep track of who is doing what. 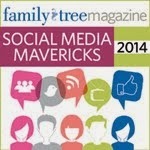 Thanks to Tim Cross for giving us another opportunity to talk about our work with New FamilySearch. We really appreciate his help. Tim and I in Logan. And thanks Mike Booth for the picture. If you are already on New FamilySearch, you can order the charts now from www.generationmaps.com/nfs. It is functional but we are still working on it, so if you have any troubles, give us a call. We'll continue working on it as New FamilySearch updates and rolls out. At that point, we'll move it to the front of the website. The reception was good in Logan. We had alot of people who were excited to have a "map" to navigate that database. Hopefully it will help. I know I'll be using it myself. And we would love to have your feedback on how we can improve it too. Find A Grave and the Super Sleuths. That is what it is all about. Grounding the next generation in the last ones. The visual history of your ancestors is possibly the most important part of your family history because it is the part that breathes life into the stories and vital statistics. While searching for your family's history, you may have come across many pictures or a few, but no matter what you have accumulated, you definitely want to make sure it lasts for the generations to come. Get some cotton gloves. The first thing you want to do whenever you are dealing with photographs is wash your hands and get some white cotton gloves. By far the most damaging thing you can do to your photos is love them to death. Besides fingerprints, the oils on your fingers can do lots of damage even when you are careful. Keep them in the living area of your home. Keeping your photographs where you live will do a lot to protect them from temperature fluctuation, humidity, insects, and dust. Closets or bookshelves are much better than an attic or basement. The comfort that you like for your surroundings is also very comfortable for your photos. Make a copy that you can enjoy. 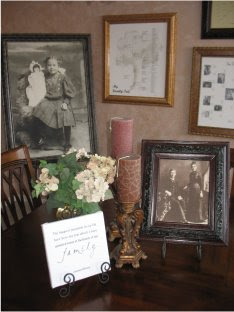 Make a good quality copy and keep the copy out where it can inspire you and help you in your family history endeavors. A good copy will allow you to put away the original to protect it from light and dust, two big enemies of your photos. Generation Maps canvas giclee reproductions are a great archival way to enjoy your history and decorate your home. And Generation Maps decorative charts can help you display one or may pictures with the genealogy information in their family context. Let the copies show the people around you how important your family is to you. Keep the most precious photos put away for future generations. 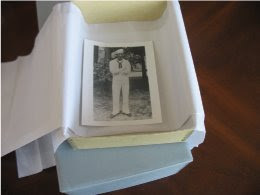 Once you have a copy, lay them flat interleaved with unbuffered tissue paper in short archival photo boxes the size of the picture. Keep like sized photos in the same box and have several different sized boxes for each size of picture so that a smaller photo doesn't leave uneven pressure marks on a larger photo that it is stacked with. Label the outside of the boxes to keep handling to a minimum when you are looking for a certain picture. With a few simple precautions, your pictures will be around for many generations to come. I don't know if another blog post could ever top this one. So timely if you have been reading my posts on NFS and attracting the next generation. Apparently all the monkeys are thinking the same thing. PAF, NFS, and the Princess Bride. My Thoughts on New Family Search part 2--if I were in charge. I see only one major flaw that needs to be fixed and that is the "source centricity." Without a major focus, or even minor links to the sources that all this data is being based on, the new website merely allows people to fight over what they *think* is true. And interest in the accomplishment of temple work for LDS genealogists tends to make many (but of course not all) quick and sloppy researchers. If there was a prominence of sources, the person with the source would win--and then the data would be right. Or more right anyway. This of course has to be linked first to images (of documents or photos), then to transcribed data. The church is already investing huge amounts of resources digitizing the records they have, such as in Family Search Indexing. A faster way to accumulate huge amounts of data would be to bite the bullet and allow people around the world to upload their own images and data. If I could send, or mirror, my family documents on their site, I would be more than happy, even eager, to index my own family's documents. Because I have a vested interest in those particular documents I want to index them--much more than the Ohio birth records that they send me in FSIndexing. And for the most part, I would have ownership, thus theoretically eliminating the copyright issues they are running into with the indexing project. I know it is hard for the church to want to jump into that, but they certainly have the resources, and in the end that is what needs to be done. IMHO of course. Now, if the name just didn't sound like "New Coke." I have full confidence that in these issues, like the source centricity issue, those in charge are fully aware. It will come. This will be a wonderful database for my children. If you are reading this blog, you probably know about the new database being rolled out by the LDS church, "New FamilySearch." We have been in a unique position to observe the status of the database because Generation Maps is one of the 6 companies that the LDS church chose to partner with New FamilySearch as early affiliates. I have thoroughly appreciated and been impressed with the people we have worked with in the Family History Department. Their dedication to the project is really obvious on many levels. They have done an amazing job tackling a problem of universal proportions. So, first of all, I am thrilled that it is rolling out, that they are actually getting it released. It is hard for large corporations to release something of that magnitude. Especially a corporation that feels much is at stake and doing it right is so important. At least being launched, it is there where it can be worked on and it can be improved on. If it was still being discussed in committee, we wouldn't be able to make any progress. Kudos to whoever decided to roll it out, ready or not. Second, I have finally come around to the wiki idea that the database is based on. At first I was horrified. After the first day of meetings when we were brought in to Salt Lake to begin working on the API, I didn't sleep at all. Being a librarian, I tossed and turned thinking about what was going to happen to my clean research when I put it out into that "sandbox" for everyone to play in. But Dan Lawyer slowed me down when he pointed out that librarians had built the current system, in which too few are attracted to genealogy. It can be a dry and dusty process digging through the library and carefully writing footnotes. He is right. (I can say that because I thoroughly am a librarian). It needs to be brought into the next generation with social networking. I think with coming improvements on the database, where we can communicate and work in groups, that inviting people to come and work with us will work really well. As it stands right now, though, not the most knowledgeable person or the best researcher wins, but the person with the most time to invest. That can be two very different people. There are still research principles that need to be followed, but in the end, we will be doing better if we are talking to each other. That is a real truth and the LDS church did well to base the new database on that foundation. For anyone who works with small children or wants to help children and grandchildren understand their hobby (or profession), activities of a genealogical nature are a must.The following sites help with ideas for activities for children, and can help them discover about their past and help out Mom and Dad, or Grandpa and Grandma, too! :USGenWeb-Kids: http://www.rootsweb.ancestry.com/~usgwkidz/WorldGenWeb for Kids: http://www.rootsweb.ancestry.com/~wgwkids/Genealogy Today, Jr.: http://genealogytoday.com/junior/Forms and Documents for Kids: http://www.kidsturncentral.com/topics/hobbies/genforms.htmFamily Tree Maker Magazine Kids’ Books:http://www.familytreemagazine.com/articles/oct01/kidsbooks.htmlHave fun with your family and give kids a chance to help in finding their ancestors. Had my grandmother not been open to my questions, and been willing to talk about the family, I would not be writing this column. Family history is not simply for adults. Anyone interested in the topic of family history has to start sometime, and it is easier to start when a person is young.